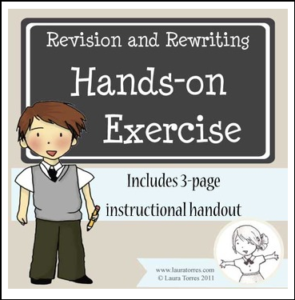 Rewriting / Revision Hands-on Activity. This exercise illustrates to students exactly why revision and rewriting is a necessary part of the writing process. It is helpful to do this activity just before a group critique or feedback session on rough drafts. This is a favorite activity in my first-year college composition class, but I have also used it in classrooms for grades 6 and up with great success. You could also modify this lesson to work simply as an instruction-writing exercise.